I love holiday desserts! 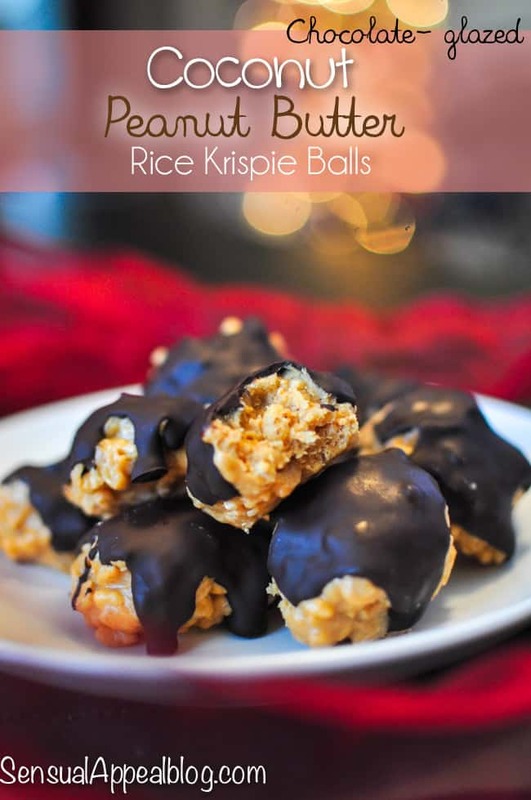 This Chocolate-Glazed Coconut Peanut Butter Rice Krispies Balls recipe is part of a sponsored shop on behalf of #KraftEssentials and Collective Bias Social Fabric Community. Christmas may be over but holiday dessert recipes are NOT. But then again… are they ever 😉 hehe. I am a sugar lover and I therefore love desserts in any shape or form. Hopefully this will not be as huge of a part of my life in the new year since I’m trying to change my eating habits but until then… holidays are still technically here and I will bask in the joy of sweetness. New Years Eve is tomorrow and therefore I wanted to prepare an easy dessert recipe that you can do at home with only a few ingredients. These are ingredients you might already have on hand, especially if it’s the holiday season. And to show you just how simple this process really is – I’ve created a video of the recipe as I’m preparing it. Heads up, this is my first recipe video filmed with my dSLRs. I’m trying to use them more often and I definitely know that I need to get a second tripod.. but either way, I’d love to get feedback on the video itself! Let me know what you think in the comments below! So back to this rice krispie balls recipe. I used peanut butter and coconut as the main flavors – they are lovely together but they are not used together enough in recipes, I think. The coating of dark chocolate adds another lovely dimension to this New Year Eve appetizer or dessert – you’re sure to wow your guests with this one. And your kids! 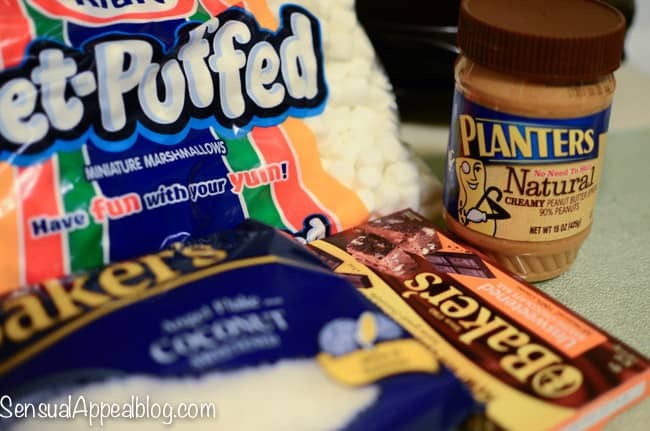 I went to Walmart and got some Kraft products there to create a simple and easy holiday desserts recipe. These products are essentials and I do tend to have a variety of them on hand – since they are very versatile and can be used in many different recipes. Whether it’s for Christmas dessert recipes, or if it’s another time in the year, it can work for Thanksgiving dessert recipes, but it could really work on any other easy dessert recipes. Gotta love versatility, no? 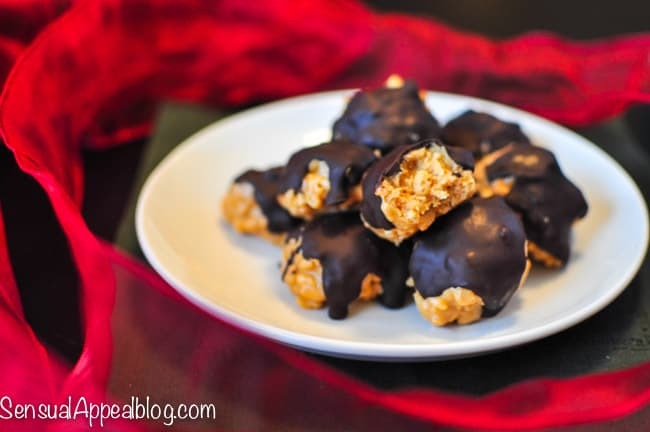 This recipe is adapted from my Milky Way Rice Krispies Balls recipe. What is your favorite easy holiday dessert? What essential ingredients for baking do you always have on hand? These are so cute and a perfect simple treat! Great job on the video friend!! I love how you throw coconut oil in there! It has such great benefits! Hello heaven! 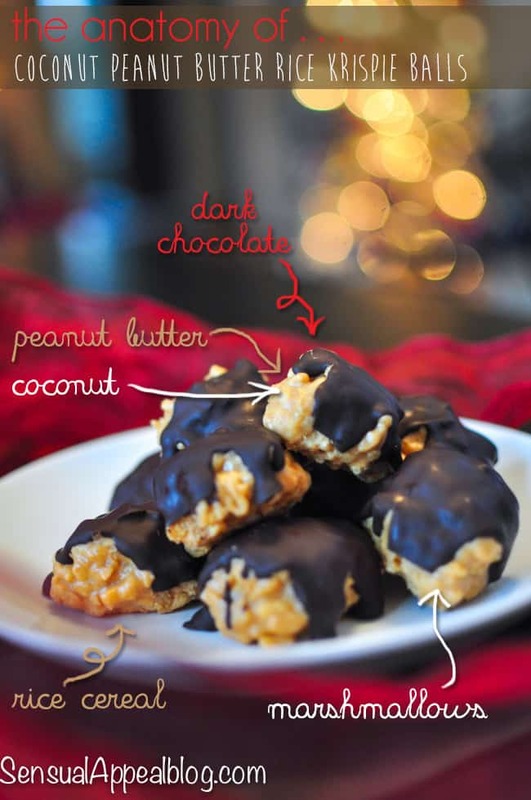 I love dark chocolate and rice krispies so this is like the ultimate snack for me! Pinterest worthy!! Anything with peanut butter, coconut and chocolate is bound to be a hit with me! Love the simplicity of these treats! Hope you are having a wonderful holiday season and happy happy New Year! I like making Oreo balls for an easy holiday dessert!! Love this idea for the krispie balls!! These look super delicious! Love that you are doing more videos! What perfect little bites!! So great for a party. these look so good! I love all the different things you used to create them! Checking these out from the bunsin my oven link party! All of my favorite things in one treat! Thanks for linking up with What’s Cookin’ Wednesday! web site; this blog contains amazing and genuinely excellent data in favor of readers. If you’re interested, email your resume to ginoboutique@gmail. Courses include Body in Motion Drawing, Eco Seminar and Portfolio Review.